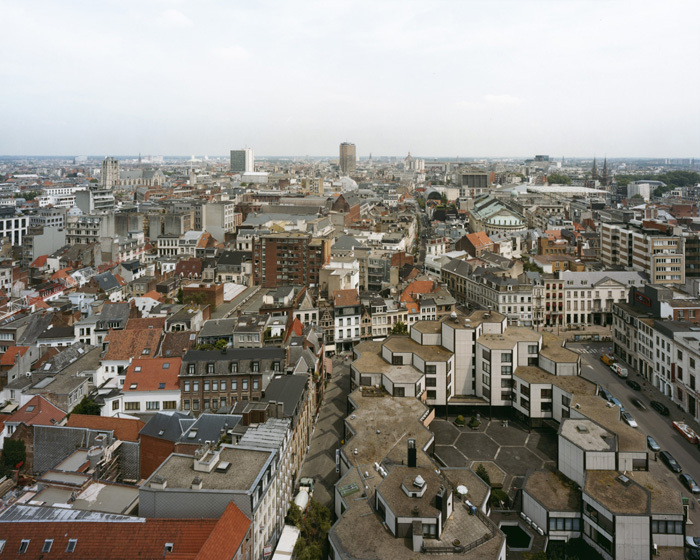 A few weeks ago I had the great pleasure of touring Antwerp with the photographer Sze Tsung Leong, who was there working on an ongoing project documenting cityscapes. We scouted out some of the places from which he'd shoot, and a few of the extraordinary results are produced here. 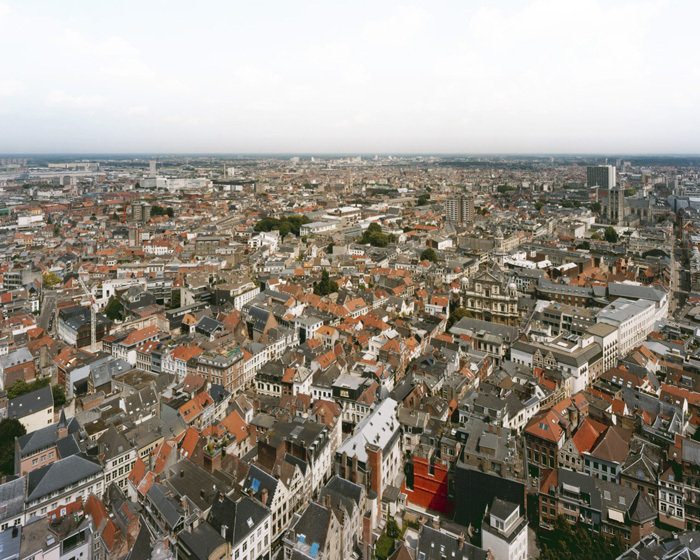 The image above, of the winding lanes of Antwerp's elegant historic center, was taken from the bell tower of the Onze Lieve Vrouwekathedraal (Cathedral of Our Lady). The single baroque church facade standing out in the middle right is St. Charles Barromeo, designed by none other than Peter Paul Rubens—he was an architect in addition to his many other careers. Rubens's tomb is at the Church of St. James, visible in the upper right corner of the photograph. 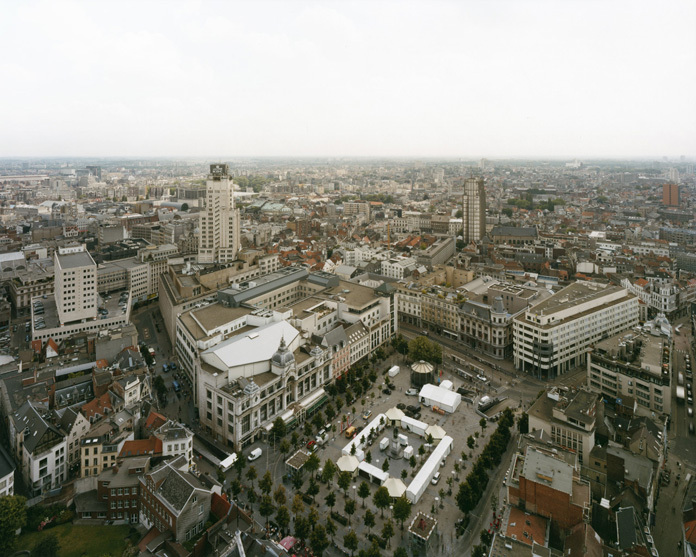 Rubens is visible as well in this shot, also from the bell tower, of the Groenplaats, Antwerp's central public square. He's the bronze statue enclosed by the white frame of tents in the bottom center of the frame. The brutalist honeycomb at the base of this image is a shopping center contiguous with the Oudan, the police tower from which this image was shot. 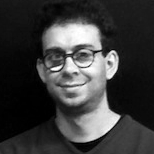 The architect was Renaat Braem. The elegant hemispherical structure in the middle right, is the neoclassical Bourla Theater, named for its architect. And now for something completely different. 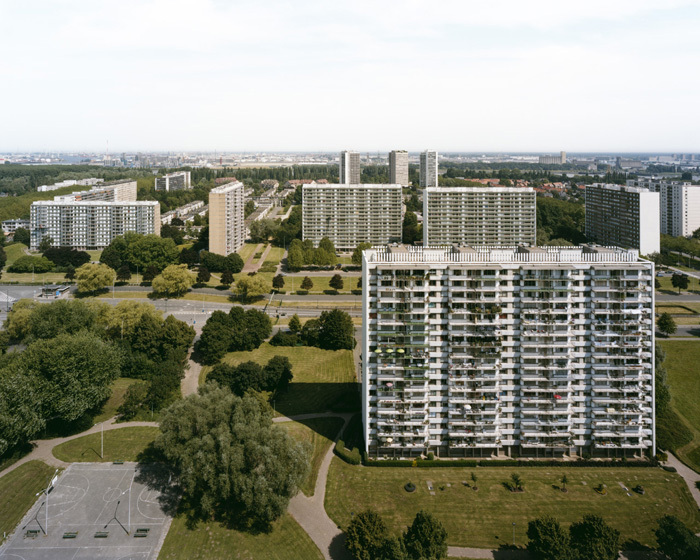 These housing projects are on the opposite, left bank of the Scheldt River. The place appears utterly vacant and abandoned, the trees like toy models, but if you look closely, you'll actually see vibrant life in the buildings themselves.